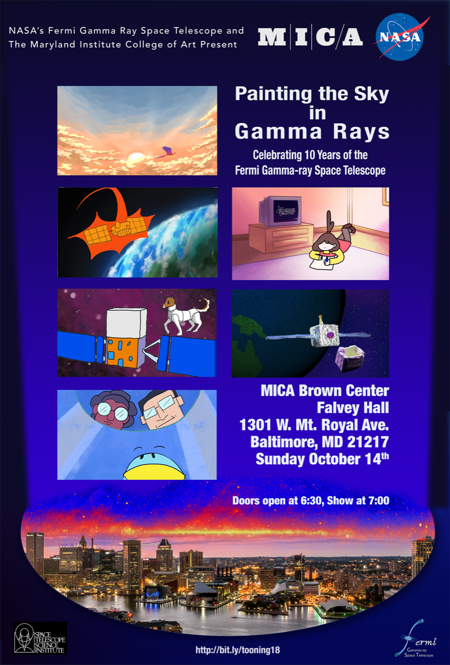 The Fermi Gamma-Ray Space Telescope and the Maryland Institute College of Art (MICA) proudly present the world premiere of the animated short "Fermi 10x10" and a series of short animations that explore some of the fascinating discoveries made by Fermi through the lens of art. The presentations will be curated by a scientist as well as an animator. At the end of the event, there will be an opportunity to ask questions to both the scientists and the artists who participated in this endeavor. The animations were created by students from the MICA Astro-Animation class. For questions, please contact us. To get from the Sheraton to MICA (Brown center) you could take the light rail and get off at University of Baltimore - Mount Royal which is very close to MICA. If you have a DC Smartrip card you can use that in Baltimore. Or, you could get an Uber for ~$8. Parking is available either in the Bunting Lots or the 81 Mosher Street Lots. Please see the map for details.